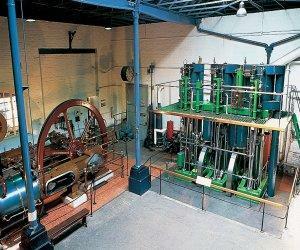 London Museum of Water and Steam020 8568 4757work MuseumBe amazed by the massive historic engines that pumped Thames water to London's taps, and follow in the footsteps of Charles Dickens to explore London’s exciting watery past at our newly refurbished Museum. Get hands-on to find out more about the gruesome details of the capitals watery past, and water's role in the Victorian battle for public health, in our new interactive Waterworks. In the Waterworks and the new outdoor Splash Zone you can test your muscle power as you have a go at water-pumping machines from throughout the centuries. The brand new Stokers Café is situated at the entrance of the Museum, it is accessible without having to enter the Museum and is open every day from 11am – 4pm. Customers can choose from a selection of hot and cold drinks and a range of snacks throughout the day. A fun and relaxed atmosphere, it is perfect for meeting up with friends, enjoying a coffee and refuelling before exploring the Museum. The Museum shop stocks an ample range of books and souvenirs whether you have a specialist interest in the Museums exhibitions, history and culture, or just want to treat yourself or a loved one to a beautiful gift we are sure to have a product to suit. The shop also features the unique Made at Kew range which features exclusive artistic products made on site by our creative tenants. The Rotative engines are in steam every weekend along with our Cornish engines on selected weekends. The Waterworks Railway runs every Saturday, Sunday, Bank holidays and selected Fridays in August school holidays. •	The Waterworks – A fascinating interactive exhibition telling the vital story of London’s water supply, the capital’s life blood, through the ages. •	The Splash Zone – A fun hands-on water play area where families can explore how water moves by pumping it through pipes up to 5 metres high! •	Modern interpretation panels throughout the Museum explaining the key stories and characters surrounding our unique collection of steam engines and grade one listed buildings of this heritage site. Be amazed by the massive historic engines that pumped Thames water to London's taps, and follow in the footsteps of Charles Dickens to explore London’s exciting watery past at our newly refurbished Museum. Open daily from 11am to 4pm except 25th / 26th / 27th December. Adults £11.50, Concessions £10 Children (5-15yrs) £5. For £3 per person you can upgrade your day ticket to an Annual Pass. Look for the tall Victorian tower.